The Girls Academy is an initiative of Role Models and Leaders Australia, a not-for-profit charitable organisation founded in 2004 by Olympian and champion basketballer Ricky Grace. The Girls Academy develops and empowers Aboriginal girls through leadership training, mentoring, sport and extra-curricular programs. The Academy's goal is to create an environment within schools where the girls receive the support and programs needed to help them realise their full potential. 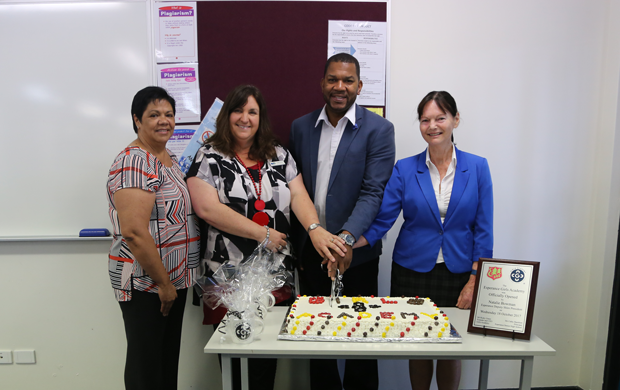 The Esperance Girls Academy was officially opened by Esperance Deputy Shire President Natalie Bowman and Ricky Grace. Also in attendance for the Academy launch were Gail Adamson Reynolds and Joanne McDonald, Independence Group (IGO) Company Secretary. Esperance SHS is very excited about this new program and we look forward to sharing this journey with you.